Welshie Walks: An informal gathering in the Victoria BC Area. 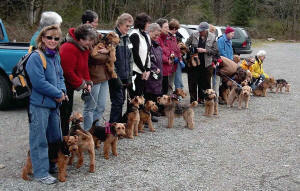 All Welsh Terrier owners welcome! People tend to gravitate towards one another when there is a common interest - dog ownership definitely is one of those things that help bring people together. In the Victoria area (Southern Vancouver Island), this has developed with our breed and there is a terrific informal group, that gathers a few times a year. And, the pictures show that it happens in a fairly big way! As with anything, the specific attendees change from time to time, but there is a nice core group, and many have become friends from over the years. **An almost St. David's Day Walk! Meet at the Elk/Beaver Lake Park trails at 11am, and plan to walk for about an hour. If you want to join in for lunch afterwards (Med Grill in Royal Oak), please contact me and I will put you in touch with Jane, who is coordinating the gatherings. Take the Royal Oak exit from going either northbound or southbound on the Pat Bay Highway and go west, away from Broadmead. Turn right immediately onto Elk Lake Drive and then go left at the entrance to Beaver Lake park. Drive into the park and follow the road along, driving through the first large paved parking lot (with the lake on the right). Keep driving - you will come to a large open gravel lot - park there as we will meet at the grass field and go walking from there. We will not be hard to spot! Trails may be a little muddy so come prepared. A few Darwyn WT Owners enjoying the gathering! Michael and I have not yet had the opportunity to participate (we live a ferry ride away, and a couple of hours from the ferry to begin with). However, a number of dogs that I have bred, and retired show dogs that were placed in companion homes, do attend. Every year I receive great photos and feedback about these Welshie Walks. I hope to participate in the future if it doesn't conflict with our commitments at home and showing. After you read about it below, and see some of the terrific photos, perhaps you will also want to either participate with Wendy and her group, OR perhaps you could start your own informal gathering. By ALL accounts - it's a lot of fun for all involved! So, please check some of these photos out and feel free to contact me and I will forward your name to Jane to be added to the email (mailing) list! Wendy, a local realtor in the Victoria area has a passion for her companion Welsh Terrier (and now after many years, owns her second one). She's not a breeder, or a breed club member, just a pure fancier of our breed. 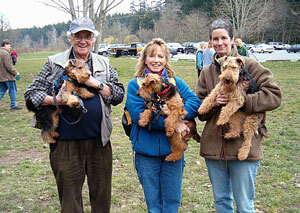 In 2001, she decided to hold a BBQ at her home and opened her yard to other Welsh Terrier owners in the area. Well, that was an experience! Good food, great people, lot's of fun and wonderful dogs ... but next time, she decided that it would be somewhere that you don't have to clean up after that many dogs all running around together in one place! So now, this informal group that she keeps in touch with (and adds to) has grown over time. The walks are now being coordinated by Jane, Lily's owner (Lily is a Darwyn bred Welsh Terrier). As it turns out, many of the people have become good friends, take care of each others dogs, and none of this would have happened, or people met, without these informal gatherings. After the BBQ in 2001, the group evolved over the years to do a number of walks at the Elk Lake trails. This area is far from main roads, and are much safer for those dogs that like to take off (editors note - while I always request that puppies that I have bred stay on leash, some owners over time, after knowing their dogs, do feel comfortable having their dogs off leash in certain situations.). After the nice long walk, many of the participants usually then go to lunch at a nearby pub afterwards. Realistically, with such a big gathering, it is a bit too chaotic to get to know each other, so the lunch afterwards has turned out to be quite popular, and a way to help people get to know each other. The group has also gone to the Thetis Lake area to go for a walk. One time they went there - it started to rain (yikes - but this is Southern BC ... and the wet coast, so it turned out fine). They usually get together 3 to 4 times per years, and they always try to go as close to Saint David's day as possible, and since this is Southern BC (and not other colder parts of Canada), they usually get together around Christmas or New Years as well. Typically, there are anywhere from 10 to 25 dogs (started with 18) plus assorted owners and friends. While the focus is on Welsh Terriers, they are just as happy to have other dogs join in - one picture shows a Westi for example! 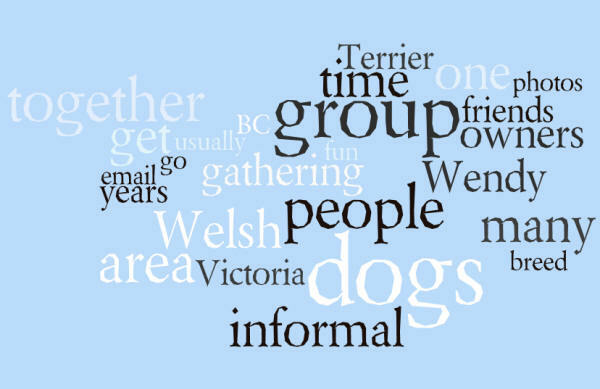 The group has primarily grown by word of mouth, as well as breeders like myself informing new puppy owners on Vancouver Island about the group. Wendy now has an email list of interested people, and whenever there is an idea to get together, she'll send out an update request to see who's interested. So, if you are - please contact me! I know for people that have one of my dogs and have participated, that they have found it to be a lot of fun to get together and many good friends have developed from these. Hope you can attend if you live in the area - or consider putting together an informal gathering group of your own if you live elsewhere!